Software solution providers, equipment manufacturers and numerous technology innovations are supporting growth in our industry while concurrently lowering operating costs, improving productivity and enhancing visibility from farm to fork. 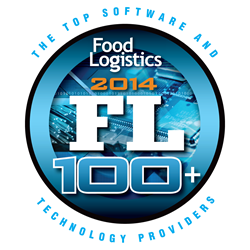 Food Logistics, the only publication dedicated exclusively to the global food and beverage supply chain, this week announced the eleventh annual FL100+ list, which appears in the November/December 2014 issue. Leading Cloud provider of supply chain planning and analytics solutions Blue Ridge was named to the eleventh annual FL 100+ list. Food Logistics is published by AC Business Media Inc., a business-to-business media company that provides targeted content and comprehensive, integrated advertising and promotion opportunities for some of the world’s most recognized B2B brands. Its diverse portfolio serves the construction, logistics and supply chain and other industries with print, digital and custom products, events and social media.